I haven’t vlogged in ages, and what better time to start vlogging again than during NaBloPoMo, when I have to come up with something new every day? Today, I’m answering prompt 4. Tips on surviving homework hour with the kids. 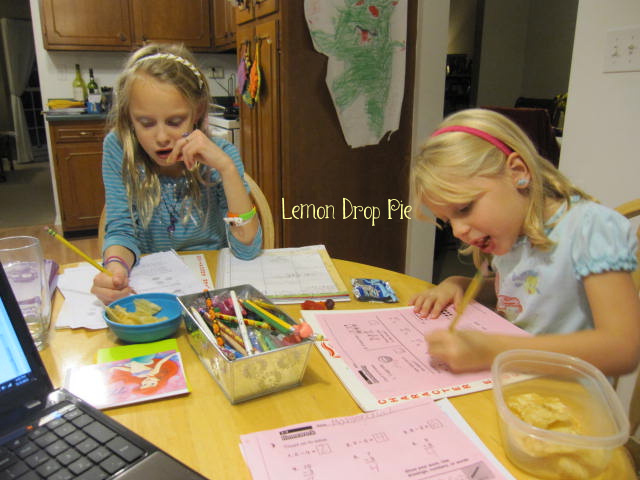 Tip number 1: give your kids potato chips while they are doing homework so that the teacher will wonder what those mysterious grease stains on their papers are. Oh, I’m just kidding! I received my share of grease spots on papers when I taught second grade. My girls are in 1st and 3rd, so the homework isn’t too bad. But they do get homework, and here’s a little tip that has been helping us get through homework time. At the beginning of the school year, we put together a Homework Kit. Watch my vlog to find out more! haha!! Potato chip stains. And thanks – now I know what NaBloPoMo actually stands for! I thought the “Po” was for poetry, but that wouldn’t make sense. Cupcake holders – who knew?